If you just started out living in your own home or renting a space, you do not just need to be emotionally ready, you also have to learn and be ready about the changes you will do to add and upgrade in your home. These home upgrades that I’ll show you will change your point of view about designing and making storage for your space. As sponge is the main equipment used for washing the dishes and other stuff in your kitchen, it can be a bit messy as it is always wet and does not look so nice if left out over your sink. Make a tip-out sponge drawer and everything about washing can be as easy as one, two, three. Having a power supply in your counter helps out with so many things especially if you love having kitchen appliances. You won’t need to place them far since kitchen does not really have much power outlet around. A mixer is used mostly for baking wherein you do not really have to use it every day and yet, it takes so much of your space. So, having a storage for your mixer is a nice idea! This idea is only applicable for those who have an extra storage in their home. Have a door for your groceries where you can store them safe and sound. You don’t need to put it all in your refrigerator and stock them up. You do not have to come back and forth from the grocery store if you have this in your home. This pull-out chopping is a gift from heaven. 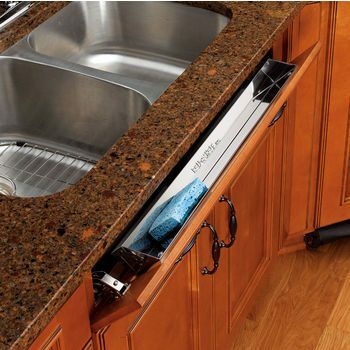 It is an all-in-one drawer where you can chop up and slide down the garbage in its instant trash bag under it so it can be easily cleaned. Spices are usually scattered around your counter while you cook and can be annoying at times. So why don’t you try having a spice drawer and make your cooking life easy?